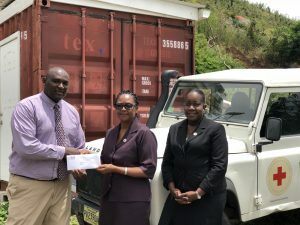 Tortola, BVI, 29 August, 2018 – The British Virgin Islands affiliate of Help For Children (HFC), a global foundation supported by Hedge Funds Care and Private Equity Cares, was pleased to award its first round of grant monies to three local non-profit groups in recognition of their outstanding commitment to the care and safety of children. 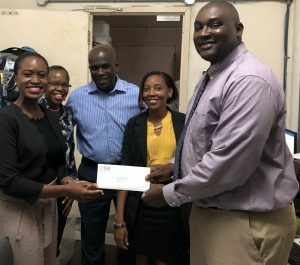 Mr. Kerry Anderson, O’Neal Webster partner and head of the firm’s investment funds and regulatory practice, presented the grant cheques on behalf HFC BVI to the Youth Empowerment Program (YEP), the Family Support Network, and the British Red Cross. YEP is a dedicated youth facility, hosting programs and activities for boys and girls ages 8 to 15 after school, on Saturdays, and during school vacations. 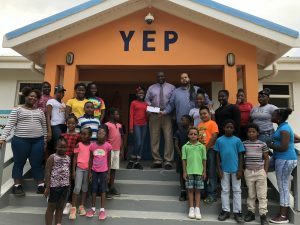 Opened in May 2007 to serve youth living on the eastern end of the island of Tortola, today, YEP offers a safe alternative to the streets for youth across the BVI. It is one of the longest-running out-of-school programs. Family Support Network was established in 1989 as a volunteer organisation under the auspices of the BVI Christian Council. Today, it operates as a non-governmental organization whose primary aim is to aid individuals, couples, and families affected by domestic violence. The British Red Cross (BVI) covers a wide range of activities to address local needs, including disaster management, community health, first aid training, and youth programmes. HFC BVI Founding Benefactors: AMS, Appleby, BVI IFA, Deloitte, EY, Folio Group, Harneys, KPMG, Maples, Martin Kenney & Co. O’Neal Webster, PwC, Rawlinson & Hunter, Tovel Consulting Ltd.
About HFC: Help for Children (HFC) is a charity supported by the alternative asset management industry with divisions in the US, Canada, the UK, the Cayman Islands, Ireland, Hong Kong, and the British Virgin Islands. With its sole mission the prevention and treatment of child abuse, as of 2018, HFC has distributed over $51 million in grants over the years, positively impacting 87,000 lives on an annual basis.